The floor we had done was put in this jan 2011. So it\'s been a month since we had waited for someone to come and call. No one yet. This is what I have to share with Empire. We had our whole house done with Empire, we did carpet and hard wood floors, spent like $14,000. A month later my son spray windex on our floor and it warped. Now the guy that installed it said, to clean it with windex. Never got around to using it. Thank God I didn't. We called Empire and the only thing they could say to us is that it wasn't under warranty. They said they would send someone out to take a look at it and no one ever came. They didn't even called to see what was going on. They got paid so way do they care now. I was going to do window treatments, but not now, Not after the way we were treated. 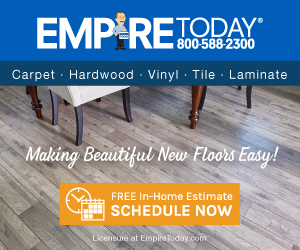 I will never spend another dime with this company and I will be telling all my friends and family that are looking for carpeting and flooring not to call Empire. Thanks alot for all your help I see how you treat your customers, very disappointed with this company. We had extra flooring, all they had to do is fix like 3 boards and we would have been ok.
Review #201985 is a subjective opinion of jcdiianni.